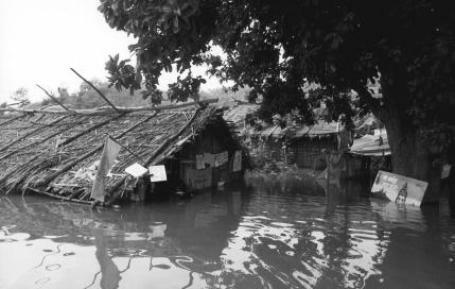 Each monsoon season thousands of people are told by the Indian government that they will have to be relocated as their ancestral lands are flooded out.� �The people whose lives were going to be devastated were neither informed nor consulted nor heard� (Roy 26).� A disproportionate number of those being displaced are tribal people: Adivasis and Dalits. Damming the Narmada River will degrade the fertile agricultural soils due to continuous irrigation (rather the seasonal irrigation which is dependent on the monsoon), and salinization, making the soil toxic to many plant species.� The largest of the dams under construction is the Sardar Sarovar, which, if completed, will flood more than 37,000 hectares of forest and agricultural land, displacing more than half a million people and destroying some of India�s most fertile land. The thing about multipurpose dams like the Sardar Sarovar is that their �purposes� (irrigation, power production, and flood control) conflict with one another.� Irrigation uses up the water you need to produce power.� Flood control requires you to keep the reservoir empty during the monsoon months to deal with an anticipated surfeit of water.� And if there�s no surfeit, you�re left with an empty dam.� And this defeats the purpose of irrigation, which is to store the monsoon water (Roy 34). In the end, the Big Dam will produce only 3% of the power planners say it will � that�s only 50 megawatts!� Additionally, when you take into account the power needed to pump water through the network of canals inevitably attached to the dam, the Sardar Sarovar Project (SSP) will consume more electricity than it produces!� Another problem with the SSP is that its reservoir displaces people in Madhya Pradesh and Maharashtra, but its benefits go to Gujarat (Roy 34-35).� Even though the arid regions of that state, Kutch and Saurashtra, are not mentioned in the water-sharing award as recipients of drinking water. The proposed dams will affect millions of people but only a certain percentage of them will be privy to the government�s resettlement and rehabilitation (R & R) programs.� The problem here arises in defining who are Project-Affected Persons (PAPs).� The World Commission on Dams urges that the �impact assessment includes all people in the reservoir, upstream, downstream and in catchment areas whose properties, livelihoods and nonmaterial resources are affected.� It also includes those affected by dam-related infrastructure such as canals, transmission lines and resettlement developments� (www.irn.org/wcd/narmada.shtml).� In reality, however, people affected by the extensive canal system are not considered as PAPs.� These people are subject to R & R packages, but not the same ones as those living in the reservoir area.� Unbelievably, those not entitled to any compensation at all are the hundreds of thousands whose lands or livelihoods are affected by either project-related developments or downstream impacts. The Narmada River, on which the Indian government plans to build some 3,200 dams, flows through three states: Madhya Pradesh, Maharashtra, and Gujarat.� Ninety percent of the river flows through Madhya Pradesh; it skirts the northern border of Maharashtra, then flows through Gujarat for about 180 kilometers before emptying into the Arabian Sea at Bharuch. Before the Ministry of the Environment even cleared the Narmada Valley Development Projects in 1987, the World Bank sanctioned a loan for $450 million for the largest dam, the Sardar Sarovar, in 1985.� In actuality, construction on the Sardar Sarovar dam site had continued sporadically since 1961, but began in earnest in 1988.� Questions arose concerning the promises about resettlement and rehabilitation programs set up by the government, so by 1986 each state had a people�s organization that addressed these concerns.� Soon, these groups came together to form the Narmada Bachao Andolan (NBA), or, the Save the Narmada Movement. In 1988, the NBA formally called for all work on the Narmada Valley Development Projects to be stopped.� In September 1989, more than 50,000 people gathered in the valley from all over India to pledge to fight �destructive development.�� A year later thousands of villagers walked and boated to a small town in Madhya Pradesh to reiterate their pledge to drown rather than agree to move from their homes.� Under intense pressure, the World Bank was forced to create an independent review committee, the Morse Commission, which published the Morse Report (a.k.a. Independent Review) in 1992.� The report �endorsed all the main concerns raised by the Andolan [NBA]� (www.narmada.org/sardarsarovar.html).� In author Arundhati Roy�s opinion �It is the most balanced, unbiased, yet damning indictment of the relationship between the Indian State and the World Bank.�� Two months later, the Bank sent out the Pamela Cox Committee.� It suggested exactly what the Morse Report advised against: �a sort of patchwork remedy to try and salvage the operation� (Roy 45-46).� Eventually, due to the international uproar created by the Report, the Bank withdrew from the Sardar Sarovar Project.� In response, the Gujarati government decided to raise $200 million and push ahead with the project. While the Independent Review was being written and also after it was published confrontations between villagers and authorities continued in the valley.� After continued protests by the NBA the government charged yet another committee, the Five Member Group (FMG), to review the SSP.� The FMG�s report endorsed the Morse Report�s concerns but it made no difference.� Following a writ petition by the NBA in 1994 calling for a comprehensive review of the project, the Supreme Court of India stopped construction of the Sardar Sarovar dam in 1995.� Tension in the area dissipated but soon the NBA�s attention shifted to two other Big Dams in Madhya Pradesh � the Narmada Sagar and the Maheshwar.� Though these dams were nowhere near their projected heights their impacts on the environment and the people of the valley were already apparent.� The government�s resettlement program for the displaced natives �continues to be one of callousness and broken promises� (Roy 51).� In 1999, however, the Supreme Court allowed for the dam�s height to be raised to 88 meters (from 80 meters when building was halted in 1995).� In October 2000, the Supreme Court issued a judgement to allow immediate construction of the Sardar Sarovar Dam to 90 meters.� In addition, it allowed for the dam to be built up to its originally planned height of 138 meters.� These decrees have �come from the Court despite major unresolved issues on resettlement, the environment, and the project�s costs and benefits� (www.narmada.org/sardarsarovar.html). Adivasi is the term used to designate the original inhabitants (indigenous people) of a region. The government of India supports the building of over 3,000 dams on the Narmada River.� What the State fails to take into account are the infinite costs of what it terms National Development; the millions of lives affected by the devastating environmental impacts of building dams. The NBA is a people�s movement formed from local people�s movements in Madhya Pradesh, Maharashtra, and Gujarat.� Through peaceful means, the NBA has brought much media attention to the plight of the native people along the river.� Medha Patkar is a prominent leader of the group. The World Bank had originally supported the Sardar Sarovar with a $450 million loan.� However, after appointing an independent panel to review the impacts of the project the Bank withdrew support.� The panel expressed much concern that the environmental and social impacts of the project had not been properly considered. The Court is one of the most formidable opponents of the NBA.� It has exercised its power over the people through judgements to continue with building of dams along the river, disregarding concerns about the dams� environmental and social impacts. In a country where 200 million people (one-fifth of the population) do not have safe drinking water, 600 million (two-thirds of the population) lack basic sanitation, and 350 million (two-fifths of the population) live below the poverty line, it is no wonder that the government of India wants to implement projects that could potentially improve the lives of the people.� Unfortunately, the State chose a method that has and will likely cause more harm than good.� According to the government, the Narmada Valley Dam Projects will provide water to 20 to 40 million people, irrigate 1.8 to 1.9 million hectares of land, and produce 1450 megawatts of power.� The Narmada Bachao Andolan and other organizations believe otherwise.� They believe these claims are greatly exaggerated.� These groups estimate 1.5 million people (about 10,000 families) will be displaced in the three states of Madhya Pradesh, Maharashtra, and Gujarat. A disproportionate number of oustees are indigenous people.� Eight percent of India�s population are Adivasis and fifteen percent are Dalits but an incredible sixty percent of those displaced by the dam projects are Adivasis and Dalits (Roy 18). The NBA has also taken a more diplomatic approach to getting through to the government.� They have submitted written representations (complaints) to government officials such as the Grievance Redressal Committee, the Sardar Sarovar Narmada Nigam, the President, and the Minister of Social Justice and Environment Maneka Gandhi.� More often than not, their voice goes unheard and unacknowledged. 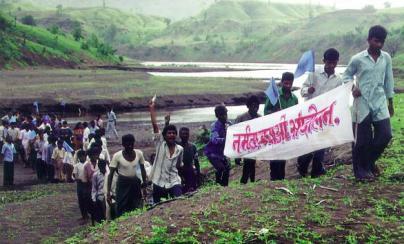 The demonstrations, protests, rallies, hunger strikes, blockades, and written representations by Narmada Bachao Andolan have all made an impact on the direction of the movement to stop the building of large and small dams along the Narmada.� Media attention from these events has taken the issues from a local level to a more national scale.� The NBA was an integral force in forcing the World Bank to withdraw its loan from the projects by pressuring the Bank with negative media attention. Reassessing the environmental and social impacts of the more than 3,000 dams slated for construction should be the first step the Indian government takes in solving the country�s water management problems.� It should then observe the recommendations proposed by those assessments, rather than ignoring them. The country and the individual states could also consider cheaper and more effective energy options that do in fact already exist.� In fact, �A task force set up by the Madhya Pradesh state government suggested alternatives such as demand management measures, biomass generation, optimum use of oil-based plants and existing dams, and micro-hydro plants� (www.irn.org/wcd/narmada.shtml). According to renowned irrigation expert K. R. Datye, a comprehensive review of the yield of the land, taking into account the water, energy, and biomass availability is required.� Datye highlights the need for regenerative water use for agriculture, using local water resources.� Water from outside (i.e. dams) is used to restore vegetative cover to degraded land and to recharge ground water aquifers that are badly depleted, to a point where water and energy balance can be maintained (www.narmada.org/sardar-sarovar/ecotimes.alternatives.html). The following watershed management strategies are traditional practices that have been revived by local communities in the states of Madhya Pradesh, Maharashtra, and Gujarat with the help of Non-Governmental Organizations and state government programs. Revival of old and building of new water harvesting structures coupled with formation of gram sabhas for equitable water distribution has transformed the people of the semi-arid, drought prone district. Awarded the "DOWN TO EARTH-JOSEPH C JOHN AWARD" for India's most outstanding environmental community. A complex rainwater harvesting system developed over centuries by the Maldharis of Banni grasslands is threatened by natural factors and man made interventions. MP state government's emphasis on participatory management, trans-parency and decentralization in implementing watershed development programs sets an example that could be replicated all over India. Thunthi Kankasiya & Mahudi, Dahod Dist. Villages in Gujarat that have taken watershed management measures have enough water for drinking and even irrigation in the middle of the most severe drought of this century. Alternatives to dams do exist and should be considered seriously. �India: Peaceful Demonstrators Against the Narmada Dam Project Arrested, Beaten, and Intimidated by Police.�� The Sierra Club: Human Rights Campaigns.� 1999. �Medha Patkar.�� The Goldman Environmental Prize.� 1992. 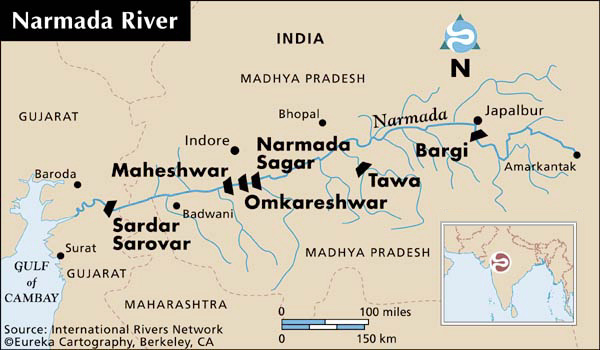 Narmada River page.� International Rivers Network.� 1996-2000. Roy, Arundhati.� The Cost of Living.� New York: Random House, Inc.� 1999. �The Sardar Sarovar: A Brief Introduction.�� Friends of the River Narmada.� 2000.